This is our most popular course that teaches you how to become a more successful consultant. Packed with strategies, techniques and action steps to help you land more clients and increase your consulting income. The Consulting Success System 2.0 includes 14 lessons that cover how to successfully position yourself as an authority in your market, set your ideal pricing and fees, and attract new clients now and well into the future. All Consulting products are backed by our 100% money back satisfaction guarantee. 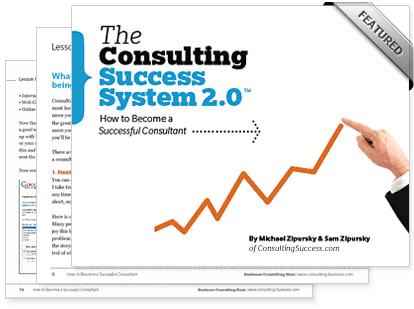 This no-nonsense guide to understanding, setting and increasing your Consulting Fees is packed with proven strategies to help you make more money as a consultant. Learn from the world's leading consultants as they teach you how to build and grow a profitable consulting business in these in-depth interviews. Learn how to write proposals and agreements to win more business. You'll also get access to proven proposal and agreement templates that have been used to win millions of dollars in consulting projects. Learn 17 of the most powerful consulting tools and get a complete guide to management consulting with this package. This Guide teaches you everything you need to know about creating a unique, memorable and effective name for your consulting business.